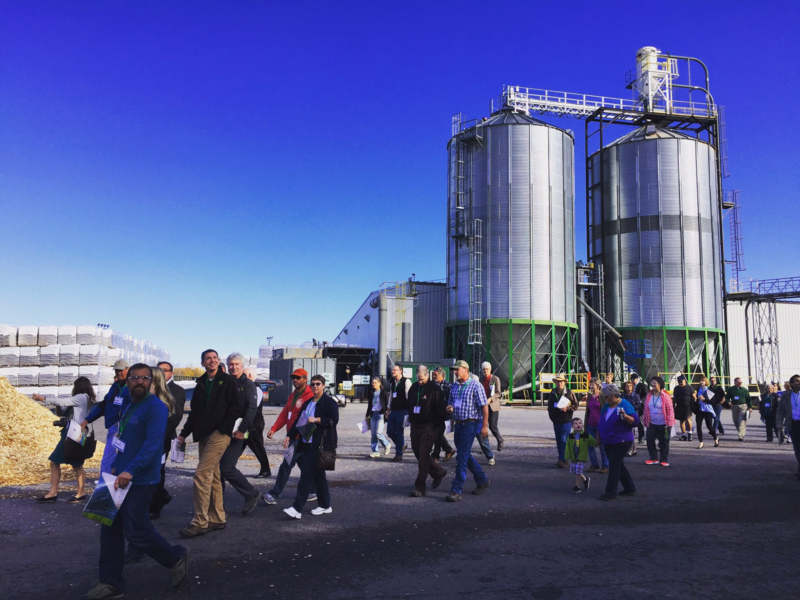 PFI member and PFI Standards Program qualified company Curran Pellets joined about 50 organizations across the country to mark Bioenergy Day on Wednesday. Their event, held at their Massena, NY headquarters, was well attended by local supporters and was covered in the local Watertown Daily Times. The New Hampshire Wood Energy Council collaborated with the New Hampshire Department of Environmental Services to celebrate the day. The two groups held an open house recognizing the completion of a new biomass wood boiler that will heat a major state building in Concord, NH. Several state and local officials contributed to the event, recognizing the benefits of heating with biomass fuels. Bioenergy Day, sponsored by PFI as well as the U.S. Forest Service, earned recognition from elected officials on the federal, state and local levels. Rep. Ann Kuster (D-NH), co-chair of the Congressional Biomass Caucus, tweeted: "Happy #BioenergyDay! Using organic material for our energy needs helps our forests & sustains thousands of jobs." Rep. Bruce Poliquin (R-ME) tweeted: "I'm proud to support clean, renewable & reliable #biomass production, providing for hundreds of #MEjobs." Visit the Bioenergy Day website to see media coverage and to learn more about the 2016 Bioenergy Day events held in the United States and Canada. Visit Twitter to see more details, photos and coverage of the day by many groups and individuals on social media, including the U.S. Department of Energy and U.S. Forest Service. The Northern Forest Center, a New England-based forestry advocacy group, released a study this week detailing the environmental benefits of using wood pellets for heating. The organization commissioned the Spatial Informatics Group-National Assets Laboratory (SIG-NAL) to conduct a life cycle analysis of wood fuels, compared to a life cycle analysis of natural gas, propane and heating oil. The study took into account forestry and harvesting practices as well as the typical composition of wood pellets. The researchers used data, including energy sources, collected from 9 out of 10 pellet mills located in the New England region. Visit Northern Forest Center to view the full report and analysis. Today is the fourth annual National Bioenergy Day - a day dedicated to shining a light on the many economic, infrastructural, and environmental benefits of bioenergy production in the U.S.
On this day we would like to have a conversation about Michigan's energy future, and the important role that Michigan biomass power can and should play in a "no regrets" energy policy. People are stocking up now on wood pellets, and a Bedford company announced it acquired a popular brand to add to its arsenal. American Biomass announced Tuesday it was acquiring the brand name, trademarks and customer lists of Okanagan Wood Pellets from Viridis Energy Inc. of Vancouver, Canada, according to CEO David Nydam. Nydam said he expects the purchase will result in expanding its 15-person Bedford work force. Congress is about to make a decision that could have profound effects on the forests of Wisconsin and the future of American energy. They are considering if the United States should treat "biomass" energy generated from forests - one of the most renewable, recyclable and greenest resources on the planet -as a part of our clean energy solution.